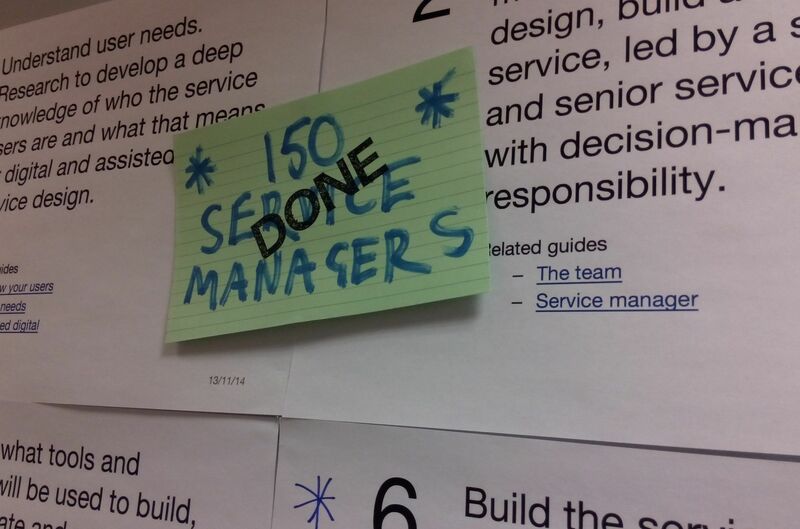 The Recruitment and Skills team recently passed its target of 150 service managers completing the induction programme at GDS. In this post I wanted to set out where that target came from, how we’ve gone about meeting it, and what happens next with the service manager programme. When departments adopted the Government Digital Strategy back in November 2012, they committed to creating a new leadership role for each of their transactional services – the service manager. Action 2 of the strategy committed that services handling over 100,000 transactions each year would be re-designed, operated and improved by a skilled, experienced and empowered service manager. The Recruitment and Skills Team in the Government Digital Service (GDS), took on the task of providing a specialist induction and development programme for new service managers, to include the hands-on process of designing and prototyping a digital service. According to Transactions Explorer there were around 150 services with more than 100,000 transactions per year. Balancing natural turnover of staff with the potential for one manager to look after several smaller services, 150 became our target for the number of service managers to train by April 2015. Working at this scale meant that the programme was big enough to make a difference across departments but small enough to deliver a good quality experience as we could take service managers through the programme in cohorts of about a dozen. The Service Manager Programme was a brand new initiative to help deliver digital transformation. In April 2013, we ran a short discovery to shape the programme around the topics current and potential service managers told us their user needs. In June we welcomed participants for the alpha. The beta followed in July and we went live in the autumn with 3 more groups. As part of the programme, new delegates would spend quality time with GDS colleagues and have a chance to experience working together in the small, self-organising teams that we advocate for developing digital services. As much as possible, sessions would be run at GDS headquarters, Aviation House, so service managers could see for themselves the working environment and practices of GOV.UK and the other GDS teams. Since then we’ve iterated the Induction Programme based on participant feedback, and created two further courses, the Foundation Day and the Open Programme, for people in other digital roles. Fast forward to March 2015 and we’ve passed our initial target - more than 150 civil servants taking what they’ve learned back to 42 different departments and agencies across the UK government. 150 might seem like a small number in terms of the whole civil service, but these pioneers are performing a role that hardly existed in government 2 years ago. And they’re already making a difference. As Rob Banathy wrote earlier this year, a digital service is much more likely to pass a service standard assessment if it is headed by someone who has been on the Service Manager Programme. Programme alumni have become stalwarts of a new cross-government service manager community. Some have come back to Aviation House as guest speakers to share their experiences with other cohorts. Building on the community aspect of the programme, we’re also about to launch an alpha of a programme for more experienced service managers to mentor people who are new to the role. If you are a Service Manager, join this community today by registering here. There’s still demand from departments for places on the service manager programme. Since we set our original target, the Transactions Explorer list has grown to 174 services with 100,000+ transactions - not to mention the many smaller but significant services that need service managers. Those are all things we want to continue. Request a place on one of the next 3 service manager cohorts. (V, W and X) in summer 2015. We name the cohorts alphabetically and started at C, D and E, so before long we’re going to run out of letters. If you have suggestions for a new cohort naming convention, please let us know in the comments below. Following digital, data and technology people and skills activity across government.